We chose to do both the “pre-trip” and the “post-trip” extensions that rounded the tour out from a one week cycling vacation to a two week holiday. We left Ottawa midway through October and flew overnight from Montreal through Munich and Frankfurt to Dubrovnik. After the long set of flights we arrived in Dubrovnik around 5pm local time (6 hours ahead of the time at home) and were met at the airport and taken to the beautiful Hotel Bellevue for the next few nights. We had a briefing with the local VBT liaison about Dubrovnik, Croatia in general and the war (which he preferred to call an aggression) that occurred between the Serbian led Yugoslavian army the Croatians who had were declaring independence in the early nineties. We booked a short walking tour of the old city of Dubrovnik for the next day, and a longer day tour of the area around Dubrovnik, Cavtat and the Konvale Valley for day after. Fairly exhausted we set out for the old city to find something to eat, but upon finding a number of restaurants full indoors we settled on a nice little place offering pizza, maybe not quite the most authentic Croatian food but not far off as there is a great deal of Italian influence. After that we cabbed it back up to the hotel and crashed for the night. Tuesday morning, our first full day, we set out on a walking tour of the city with our local guide. The tour was fairly brief starting at the Pile Gate, moving through the St. Francis church, one of the city’s many churches and continuing on through the back streets of the city. 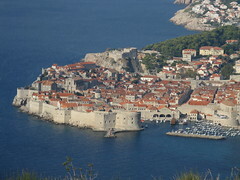 The old city of Dubrovnik was named as a UNESCO World Heritage Site in 1979 and is really quite remarkable. The old city, formerly called Ragusa under Roman rule, is completely surrounded by fortified walls and houses numerous stone buildings laid out upon narrow, stone streets. 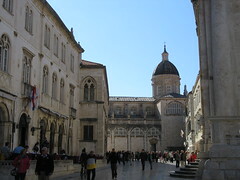 The main street, called the Stradun, is built with large limestone tiles that are worn to a shine after so many generations of inhabitants and tourists treading across them. After our tour, Meg and I set out to walk the walls, one of the highlights of any trip to Dubrovnik. The nearly 2km circuit did not take us long (as the city wasn’t as crowded as it can be during the summer) and afforded us some amazing views of the city. The walls provided great views of all the terra cotta style roofs as well as glimpses of the islands not far from the city. Once we’d completed our hike around the city we chose to check out the old port, protected by the walls and the natural bay. We found some swimmers who were braving what we felt must be a fairly frigid temperature out beyond the breakwater. Leaving the old port we made our way into the Rector’s House, which is now a museum. The city used to elect a new rector every 30 days. This person was essentially the mayor of the city and a person could only be elected once a year; talk about administrative turnover. Inside they house the original bronze “Jack O’Clock” statues. These statues are mechanized bell strikers, or jacks, that are used in the town clock - very neat. We happened to visit the museum on the closing date of the Ruđer Bošković exhibit. Bošković was a true renaissance man who hailed from Croatia and spent a great deal of time in both Italy and France. He contributed to the fields of mathematics, physics, engineering, astronomy, philosophy, poetry and diplomacy during his lifetime. We had some gelato and sat in the sun for a bit before heading into the Francisco Monastery museum that was quite small (and more expensive than the Rector’s House!). Its saving grace was it’s beautiful cloister where we sat down for a few moments to relax. 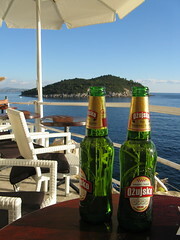 We then visited a few shops as we made our way to the Buža bar to watch the sun set on the Adriatic. This little bar (one of two actually) is set upon the rocks outside of the walls over the ocean and has an incredible view. After the sunset we made our way slowly through an emptying-out old city to a restaurant, Posta, just outside of the Pile Gate. 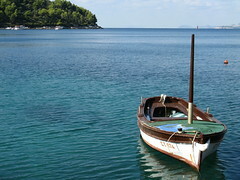 We enjoyed a fish dinner and some Croatian white wine before retiring for the evening. Our second and last full day in Dubrovnik began by taking the elevator of our hotel down to the private beach. While a bit cold, Meg did put her feet in the sea, which was more than I did. We then hopped on a mini bus with the other members of our group for a tour of the area outside of the old city. We started off by visiting the Franjo Tuđman Bridge which is fairly modern and opened in 2002. It had been planned before the war, but was redesigned afterwards and now provides faster route out of the city. As a result of the bridge’s height, cruise ships which pull into the new port must now use a local port captain in order to negotiate the required turns to get out of the port. The location of the bridge provides a nice view of the new port and the newer parts of the city. Leaving the bridge we travelled back through Dubrovnik and up onto Mount Srdj that looks over the city. There is a cable car up from the city, but since we were on a bus tour we were able to use the bus to get up there instead. At the top of the hill there is a fort that dates from Napoleonic times and was used to protect the city. The fort used to house a museum, café, disco, etc. before the war, but was heavily damaged when the Yugoslavian forces occupied it. 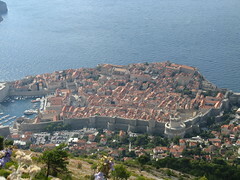 Much of the devastation to Dubrovnik during the war originated at this site. Now there is a museum devoted to the war itself. This museum has a number of photos of the devastation and video of the attacks along with assorted artefacts from the time. Our tour guide, Dario, was a teen during the war and was able to give quite a bit of personal detail. He was sent away from Dubrovnik to live with relatives in Split, which was largely unaffected during the war. The view of Dubrovnik from the roof of the museum was quite amazing. After the museum we continued onwards to Cavtat, a cute little town not far from Dubrovnik. Meg and I walked around the peninsula from bay to bay of the town while most of the others shopped. Our guide had suggested lunch at a restaurant in the Konalve Valley and so we took the short trip there. Lunch consisted of some excellent food (cooked ‘under the bell’ – a traditional method of cooking in Croatia) and allowed the group a good chance to get to know one another. From there we made our way back to Dubrovnik where we hung out in the hotel before heading down into the old city for dinner. We had some scampi (think big shrimp, still in their shells) and boy were they difficult and messy to eat. After dinner we took in an hour-long concert by a string quartet in a small chapel. It was really quite an amazing experience, the music was excellent and the atmosphere matched. The next day we were off up the coast towards Trogir, Split and the biking portion of our tour. But all that will be in upcoming posts.